Understood Betsy appeared on scene in 1916 thanks to Dorothy Canfield Fisher. It is the story of a nine year old orphaned named Elizabeth Ann who is raised by her over attentive Aunt Francis in her Great Aunt Harriet's home "in a medium-sized city in a medium-sized state in the middle of this country." When Great Aunt Harriet becomes ill, Elizabeth Ann is sent to live with some relatives in Vermont until such a time as Aunt Frances is able to resume her abundant care and attentions to the young girl. Elizabeth Ann arrives in Vermont a pale faced, timid creature who is unaccustomed to getting out of bed in the morning without someone coming and bidding her to do so. Never before had she helped cook a meal, dressed herself or walked into a school room all alone. Prior to Vermont, Elizabeth Anne's Aunt Frances had tended to all of her needs and had "understood" her better than anyone. It is under the care and direction of Elizabeth Anne's Vermont relatives that she not only learns to tie her own shoes (pretty much) but learns to care for others and watch out for herself. Her full name is traded in for the nickname of Betsy. She is given a pet cat, a doll, and the freedom to walk in the woods all alone. Through all of this the pale sickly child turns into the browned, strong and healthy Betsy that blossoms through daily romps outside and good home cooked meals. The story is quite predictable, the end result being a permanent arrangement for Betsy to continue to live in Vermont. Although this story was written for children, I got the distinct impression that the message of the book is directed towards adults. The pervading message is: if you let children explore the world around them and learn things at their own pace, they will be educated success in life. It came as no surprise then to discover, upon completing the book, that Fisher was a strong proponent of the Montessori method of child rearing. It's very obvious in her writings that she is encouraging people to live an exploration. For the record, I have no notable objections to the Montessori method. I was just disappointed that this children's book read more like a lecture to parents than anything else. Is it a cute story? Yes. Loveable orphan finds a loving home and blossoms under the care of amazing relatives. She learns about history through butter making and school desks which had hosted various students throughout the history of the region. This book is a home school mother's dream. (I was home schooled and I continue on with that dream for my own kids.) But I really don't like pieces of fiction that try so hard at presenting a message that they lose the story in the process. I'd rather get the message by losing myself in the story, if that makes sense. (There is a distinction.) In other words, don't try so hard. I think Fisher tried too hard to argue her point through a story and instead it kinda falls flat and seems stiff and, at times, unbelievable. Interestingly enough, Eleanor Roosevelt declared that Fisher was on the top ten most influential women of her time. Fisher received some notoriety for her writings and war efforts. She was an outspoken promoter of the Montessori method. She believed in what she did and she wrote about it. Nothing to fault in that. 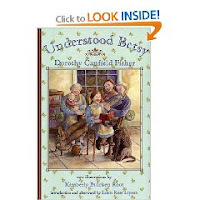 Understood Betsy was an intriguing book and I liked the premise. I just do not possess overwhelming feelings of glee about it because her argument for Montessori methods were so strong throughout the book that I, having no knowledge of Fisher whatsoever before opening the book, found it distracting. The best thing I can liken it to is Elsie Dinsmore except that it's not about spirituality but mental and physical development. I liked Betsy way more than I like Elsie. But the two share the same character flaw: they have been used to advance a message and as a result, their characters are stiff and unpolished and, sometimes, unlovable. I really don't know how I would use Understood Betsy if I had a daughter. This probably wouldn't be the first book I'd pluck down from the shelf and hand over. I just don't think it's overwhelmingly good. However, it is equally not bad and certainly has no objectionable material in it. But if you do hand it over to your daughter and she suddenly expresses an interest in taking life at her own pace, well, you'll know where that argument came from. Well, I first read this book when I was about ten...and loved it. But then at that age I would only be enjoying the story and not know anything about her agenda. Always books that take a small, shivering creature who can't stand on it's own two feet and turn it into an adventuress, happy person, make me happy. So that must be why I like it. Although it is very interesting to read your review as an older person who can spot weak points in the tale. Thanks for the review, even though I have to disagree with you on how good the book was. Perhaps it is only good when one is quite young and not seeing the secret point, but then that must be a weak argument since what is good when one is young should be (hopefully) good when one is older, like C. S Lewis’ Narnia. You wrote, "I think Fisher tried too hard to argue her point through a story and instead it kinda falls flat and seems stiff and, at times, unbelievable. " I would have to agree. I found myself thinking, "All right, all right, I get it. Can we move on?" more than once. This is one I missed as a child, and I wonder how I would have reacted. Probably like Rivers Daughter. I had some of your same feelings, reading it as an adult, but I was at a point where I needed the reminder about giving kids freedom (even though it was heavy-handed). I think reading it aloud softened it a bit too, because I had the kids' reactions and not just my own.